My designs are cut from artist quality hand rolled sheets of colored glass, often accented with iridescent or dichroic (metallic coated) glass. The forms are then arranged into a design, two to six layers thick. 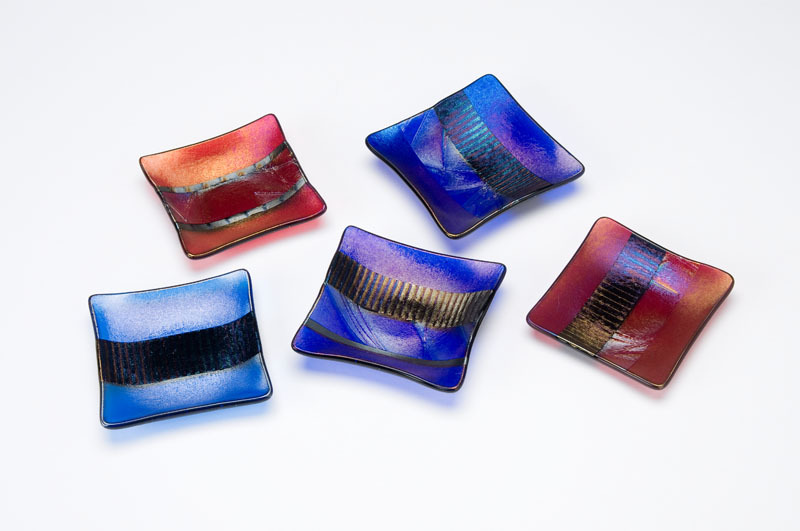 Fuse firing melts the glass to itself and forms a smooth sheet I then slump the glass to create shapes, such as bowls, or I use the fused piece as a canvas for additional layers of glass to create my wall and table sculptures. To maintain the texture of the layers of glass it is necessary to fire each successive layer separately at a lower temperature. Most of my pieces have been fired numerous times to create layers or specific textures in the final form. The nature of the raw materials and the process add to the character of the art. Slight bubbles form as the molten glass fuses creating a unique pattern. No two pieces are exactly alike. Melissa McCann has worked in ceramic media for more than 20 years, moving into fused glass art in 2001. A retired psychotherapist, Melissa lives in Occidental, California.